Cat trees provide elevated structures that allow cats to exercise their natural instinct for climbing, leaping and perching. Pet Mountain carries large cat trees and small cat trees, each with a variety of platforms, cubbies, teaser toys and scratching posts. Providing your feline friend with a vertical playspace helps relieve stress, exercise his natural instincts, and preserve your furniture. 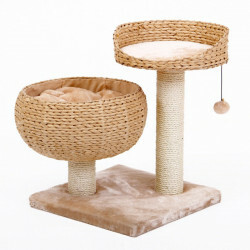 Cat condos provide cats with the special place to hide that they desire. Each cat condo creates a comfortable "den" in which your cat can feel safe from danger and get some rest from its active life. Raised cat condos allow cats to rest while keeping a watchful eye on everything going on around them, which helps improve their moods and playfulness. Cat scratching posts are the ideal way to keep your cat happy while preserving your furniture and limbs from harmful scratches. 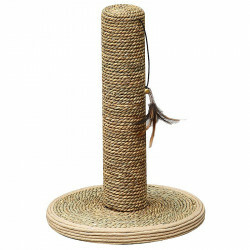 Cats like to scratch their claws by instinct, and a sisal or paper rope-wrapped scratching post is the perfect way to relieve this need. 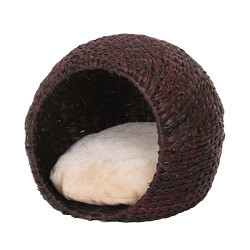 Pet Mountain's Cat Furniture store features cat products from all of your favorite brands.